You may have heard speech/language pathologists using this word when describing why they are using a specific treatment approach with your child. What it means is that a speech/language pathologist is making decisions about your child’s care based on scientific evidence and professional experience while considering your child’s specific needs. This helps speech/language pathologists (and other professionals) decide what interventions or strategies could help the child based on that child’s specific needs. There is not necessarily one approach that works for all children, especially not for all children with childhood apraxia of speech. There are some approaches that have not been studied at all or have been studied with research methods that don’t allow for very strong conclusions. Scientific evidence is empirical data that is collected and interpreted using the scientific method. This is evidence that serves to support or counter a scientific theory or hypothesis and is derived from controlled studies. Is all scientific evidence high quality? No. There are levels of evidence that indicate the quality. What are the levels of evidence? In simpler terms, an opinion from professionals that is based on professional experience as opposed to systematic research is the lowest form of evidence. 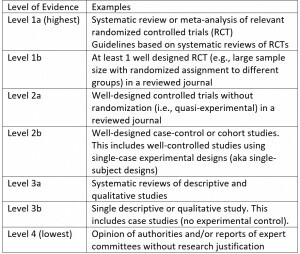 Pulling together multiple randomized controlled trials into guidelines or a meta-analysis is the best form of evidence. Anecdotes are not evidence, even more so when these anecdotes are offered by (or on websites of) people with a commercial interest. What are some factors that can decrease the quality of evidence? When looking at a CAS treatment research study, look for study limitations (e.g., small sample size, inconsistent implementation of treatment approach, lack of a control group or condition, pre-treatment differences between groups, analysis performed by non-blinded outcome assessors, etc.). Do we have much of the Level 1 standard research for Childhood Apraxia of Speech treatment? No. We have a few meta-analysis studies and systematic reviews available. For example, Murray, McCabe and Ballard wrote a systematic review in 2014 that is worth examining. However, the studies included in even that study consisted mostly small sample sizes of patients. Most of our treatment research with children who have CAS is based on small sample sizes (i.e., small numbers of patients). That said, this research has still given some answers about the best approaches for working with children who have CAS. By looking at the “evidence” a Speech/Language Pathologist can determine which approaches are most likely to work and which approaches to avoid. 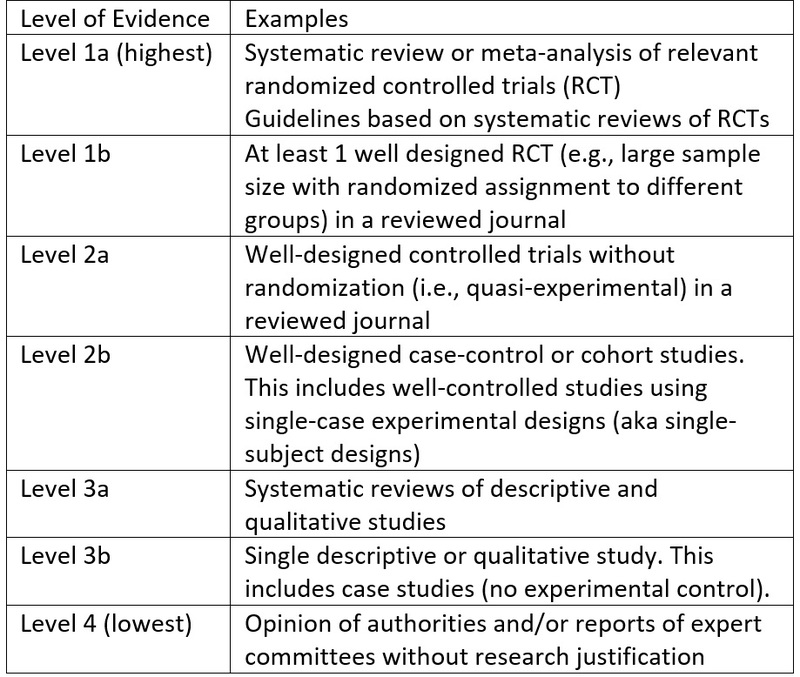 What characterizes a strong treatment research study? The gold standard for a therapy approach study is a randomized controlled trial and/or meta-analysis. When evaluating a study, clinicians look at the sample size and the consistency of the therapy process for the children. When considering sample size, think about it like this – the more children that participated in an therapy study, the more unique children participated. So if an approach seems to work for most of those cases, it is safer to think it could work for other children with like diagnoses. When considering the consistency of the therapy process used in research, the clinician wants to be sure that each child receiving “test” and “control” therapies received the same elements of those therapies. If the same therapeutic process was not followed with each child, then it could negatively influence the outcome of either group (and therefore explain any outcome differences not as a result of the intended treatment but unintended procedural differences). Another aspect to consider is the presence of other factors that could explain changes and whether these are controlled. For example, if a child also received treatment elsewhere, or if a child started school, or had a medical procedure. Of course maturation (getting older) is another factor: if a treatment study takes place over 6 months and children improve, then it might not be the treatment but it might be maturation/development. What if an approach with research support isn’t working for my child? Sometimes clinicians have to use professional experience and opinion combined with the available research to try something slightly different, particularly if the approaches with the strongest “evidence-base” aren’t working for a child. Clinicians have to monitor progress and adapt when a child is not meeting her/his goals and objectives. The approach should still have some evidence base – even if it’s minimal. Evidence base includes knowledge of theoretical foundations of how children learn, how speech production works. Based on this knowledge, clinicians can generate ideas/hypotheses (sophisticated educated guesses) about what might work for a given child. Murray, E., McCabe, P., Ballard, K.J. (2014). A systematic review of treatment outcomes for children with childhood apraxia of speech. American Journal of Speech-Language Pathology, 23, 486-504. Stephanie M. Nixon, Ph.D., CCC/SLP is an outpatient speech-language pathologist at Children’s National Health System in Washington, DC. Dr. Nixon received her Ph.D. in Communication Science and Disorders at the University of Pittsburgh and her MS in Communication Science and Disorders at Arizona State University. Dr. Nixon has worked for Children’s National since May 2008. Her clinical focus areas include speech sound disorders, Childhood Apraxia of Speech, higher order language skills, reading decoding, and reading comprehension.